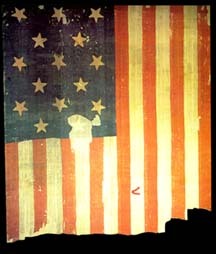 I wanted to share with you this picture of the Star Spangled Banner from the Smithsonian. I had a chance to visit the Smithsonian a couple of years ago and that flag still stays in my memory and the effort that has gone into preserving it for future generations. Thank you Smithsonian. Getting off of my patriotic platform, I wanted to spend a few moments this evening restating the purpose of this blog, my thoughts on investing, and my strategy for dealing with markets whether they be bear markets or bull markets. Please remember that I am an amateur investor, so please consult with your professional investment advisors prior to making any investment decisions regarding your own investments. However, I have been investing for 38 almost 39 years now. I have read much, and I have had my share of losses as well as gains, and I have been distilling my thoughts into this approach which is what this blog is really about. There are four basic parts of my approach that I would like to share with you in no particular order. The first thing I would like to discuss is the overall approach to the portfolio, that is how do I manage my portfolio, especially in response to market forces and to individual stock performance. I have found that I am basically unable to accurately guess the future direction of the market. I do not know from one day to the next whether the market will be rising or falling the upcoming day or week or even year. Maybe others have better luck, but I don't presume this ability. Thus, I have chosen a more passive technique for managing my portfolio. I have labeled this approach my "zen" approach, meaning that I am trying hard to listen to my portfolio, the stocks that I do own, as they through their own actions "talk" to me. (Is this too touchy-feely or what?). Simply put, my stocks can do one of two things that affect my trading activity: they can either rise in price and reach targeted sale points, an event that I refer to as "good news"; or they can drop in price and reach sale points, an event that I refer to as "bad news." Alternatively, stocks may experience "bad news" meaning actual news that I choose to interpret as being fundamentally bad. I try not to make this judgment too often but I do reserve the right to intervene to sell stocks on these real news events. And how do these events affect my strategy? Long ago I accepted the wisdom of limiting losses when they were small, and started to sell stocks at 8% losses. This particular rule was adopted from William O'Neill and the CANSLIM approach of Investors Business Daily. I could understand that avoiding large losses was important. However, I found myself buying additional stocks after a sale at a loss, and then rather quickly being handed an additional loss after selling the second stock at another 8% loss. In other words, the market was compounding my losses for me. This simply didn't make sense. Thus, I have decided that after selling a stock at a loss, that I would not immediately re-invest the proceeds. Instead I would "sit on my hands" until I had a different signal that it would be time to buy. This is where the "good news" comes in. If we are to assume that sales within our portfolios are indicative of a poor investment climate, it is also reasonable to assume that our portfolio should also be generating "good news" or signals that it is time to add a position. Since I have used a sale on the downside as "bad news" it makes sense to use a sale on the upside as "good news". It is this good news/bad news dichotomy that drives my portfolio into equities from cash and back into cash again. I like to credit Robert Lichello who wrote "How to Make $1,000,000 in the Stock Market-Automatically with some of this philosophy and strategy that he developed to move money into and out of mutual funds by his own strategy. I use nothing like what he did, but he inspired me to think about this approach. Since I cannot endlessly add positions, and at the same time, I cannot go down to zero positions as I use my positions to give me information, I decided upon 25 positions as my maximum and 6 positions as my minimum number of holdings. I suggest to people that they start at 12 positions, which would be "neutral" with 50% of their cash invested. Then, they would either drop down to 6 or up to 24 (or 25) on good news. The next thing I want to touch on is my selling strategy for individual holdings that I referred to in the above discussion. First the bad news selling. As I indicated above, after an initial purchase, I sell if a stock drops to an 8% loss. When I sell on events that I refer to as "bad news", I sell the entire position, all of the shares that I own. After making a single partial sale on "good news", which for me the first targeted partial sale is at a 30% appreciation point, then, if the stock starts to decline, I like to sell the stock entirely at break-even, keeping to the well-established doctrine of avoiding letting a stock which you had a profit, develop a loss. However, if I have made partial sales more than once, for instance, twice: once at 30% and once at 60% appreciation points, then I allow a stock to retrace only 50% of the highest appreciation sale point. That is if a stock had a partial sale at both 30 and 60% points, then I would sell all of my remaining shares if the stock retraced back to a 30% appreciation point from the original purchase. As noted above, whenever I sell shares on "bad news", I sit on my hands. I do not go out and buy a different stock hoping this time it would do better. I use this sale as a signal to pull back from the market. I "listen" to my portfolio! What about sales on "good news"? Here I try to stay with my basic philosophy of "selling declining stocks quickly and completely, and selling gaining stocks slowly and partially." What do I mean by this? I have already shared with you my strategy for selling on the downside. On the upside, I have established targeted appreciation points to make small, partial sales of my positions. While originally selling 1/4 of my remaining shares at each sale point, I realized the size of the positions was dwindling and I needed to either stretch out the intervals or reduce my sale amount. Choosing the latter, I have recently been selling 1/6th of my positions at each targeted appreciation point...and this has been working well at maintaining the size of the positions. Currently, my targeted sale points are in groups of four: 30, 60, 90, and 120% appreciation points, then 180, 240, 300, and 360% appreciation, then 450, 540, 630, and 720%....etc. These appreciation points are rather arbitrary, but at each of these points my system directs me to sell 1/6th of my holding and to use the proceeds along with additional funds to add a new position to the portfolio as long as I am under my 25 position maximum. At the maximum, the proceeds would be just placed in cash, awaiting a future purchase. How do I determine which stocks to buy? This is what all of my stocks that I discuss is about. Stocks that are suitable for buying by my strategy, are stocks which on the day that I have "permission" to add a new position are they themselves on the top % gainers list. Other criteria include a latest quarterly result with both increased revenue and earnings (beating expectations and raising guidance is a plus!) In addition, I want to see consistent revenue and earnings growth on the Morningstar report and positive free cash flow, without too much of a growth in the number of shares outstanding. Also, the balance sheet should show an abundance of assets and a scarcity of liabilities :). If possible, some valuation numbers including a PEG between 1.0 and 1.5, and a Price/Sales ratio not too high in its group, and a Return on equity that is high for its group. I also like to see lots of short-sellers who might be in the midst of a squeeze. 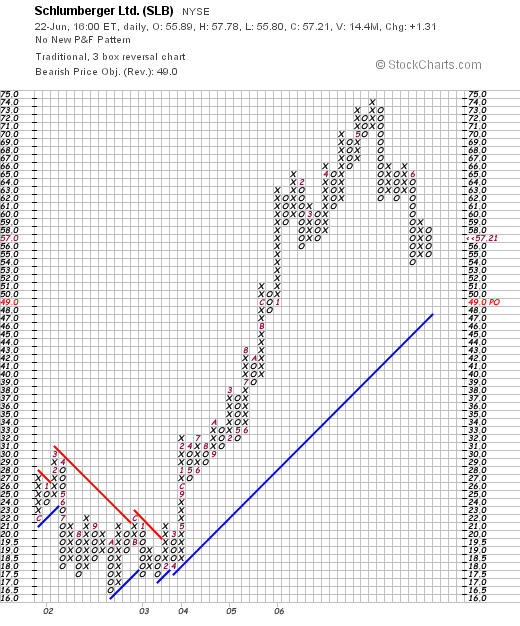 I review point and figure charts and simply put, just like to see a chart with the price moving steadily higher. Anyhow, THAT's a mouthful for this evening. I haven't talked much about my strategy for awhile, and knowing how many new people just drop by here and depart, I wanted to have another chance to share this philosophy and investing strategy that I have been employing with all of you readers and listeners! Have a healthy and safe 4th of July! An Update on my Trading Portfolio! A few moments ago I updated my portfolio on Jubak's Refugee Site on MSN where I am a member. After going through all of this work, I thought I would share with you readers my updated information on my portfolio. You can see that the size of my portfolio has been shrinking, both with sales of stocks and reduced # of positions as well as incurred losses. Overall, the portfolio is doing just fine thank you and I shall be sticking with my strategy which it may well be time to discuss on another entry. Hello Refugees! Another month has passed and I wanted to update my trading portfolio for those who may be interested. I have been using my trading strategy to cut losses at 8% and am sitting on my hands, as I like to say, until I get a buying signal, which for me is a partial sale at a gain on my remaining stocks. This analysis is as of the close of trading June 30, 2006. I am now down to 14 positions (from 18 a month ago) as the market corrected and I continued to unload positions. My maximum remains 25 positions, and I shall start replacing sales at 6 positions, my minimum # of positions planned. The account net worth is $57,085.26. I now am up to a 72.71% equity position. The market value of my securities stands at $78,508.64. My margin debit balance is now down to $21,423.38. History since last post: On 6/5/06 I paid out $575 for a car payment (I am buying my car out of this portfolio), on 6/7/06 I sold my 400 shares of Packeteer at $10.86, I sold my 187 shares of Jos a Bank (JOSB) at $27.00 on 6/8/06, on 6/12/06 I received 180 shares of Barnes Group (B) as part of a 2:1 stock split, on 6/15/06 I made a payment of $2445 out of the account for a misc. expense, and on 6/15/06 I received $200 (my monthly deposit), and paid $324.94 in margin on 6/20/06, on 6/21/06 I sold my 142 shares of Helix Energy Solutions (HELX) at $29.844, paid out a check of $255 on 6/21/06 for some blog work, and sold my 320 shares of SRA Intl (SRX) on 6/28/06 at $27.2605. As of the close of trading on 6/30/06, the account has had $241.50 of taxable income and $2,269.79 of margin expenses in 2006. The total net short-term loss totalled $(1,643.69) and the total realized net long-term gain was $8,945.43, for a total realized gain of $7,301.74. As of the close of trading on 6/30/06, the account had an unrealized gain totalling $24,113.52. I hope this continued reporting is helpful. If you are interested in my stock picking strategy, you are more than welcome to visit my blog at http://bobsadviceforstocks.tripod.com/bobsadviceforstocks/ or listen to my podcast at http://bobsadviceforstocks.podomatic.com. I am an amateur investor, so please take that into consideration before making any investment decisions based on my writing or podcast. Please let me know if these updates are helpful. I should note that on the original first post I left out my Toro stock accidentally and have corrected that problem on this post! Regards. If you have any comments or questions, please feel free to leave them on the blog or email me at bobsadviceforstocks@lycos.com. Hello Friends! I am sure I am probably jumping the gun, but here is the link to my latest entry "Weekend Review" and a preview of my new blog site for Stock Picks Bob's Advice. I am sure I am premature to start letting a few of you on the site, so note that most entries are dummies and that refinements are still ongoing. Still, the comments section is open and I would LOVE to have you all comment on the look and feel of the site and any improvements you might suggest. Thanks for helping out with this. 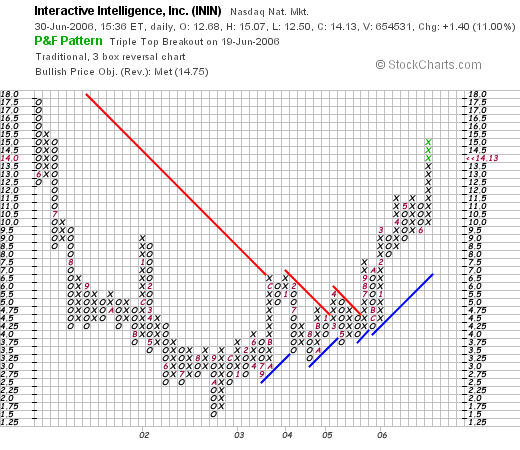 I want to talk about a stock this afternoon that may deserve our attention, Interactive Intelligence (ININ). I don't have any shares nor do I have any options on this stock. As a change from my prior recent posts, I want to try to make posting a bit simpler for me. Less photos, just the scoop :). Let me know what you think. Looking through the list of top % gainers on the NASDAQ today, I came across Interactive Intelligence (ININ), which as I write is trading at $14.27, up $1.54 or 12.10% on the day. I do not own any shares or options on this stock. But let me try to go through the numbers with you and explain why I like the company. "...provides business communications software solutions for contact center automation, enterprise Internet protocol telephony, unified communications, and self-service automation." I didn't see any news to explain today's move to the upside. Going through some of the things I like to review on a company, ININ reported 1st quarter results on April 25, 2006, for the quarter ended March 31, 2006. Revenue came in at $17.9 million, up 23% from $14.6 million in the same quarter last year. Net income worked out to $1.0 million or $.06/share, compared to net income of $25,000 and earnings of $0.00/share in the first quarter of 2005. Longer-term? Reviewing the Morningstar.com "5-Yr Restated" financials on Interactive, we can see that except for a slight dip in revenue from $47.9 million in 2001 to $47.8 million in 2002, revenue has grown steadily to $62.9 million in 2005 and $66.3 million in the trailing twelve months (TTM). Earnings show steady improvement with a loss of $(.73)/share in 2001, improving to a profit in 2004 at $.06/share, increasing to $.13/share in 2005 and $.19/share in the TTM. Meanwhile, the number of shares outstanding has stayed relatively constant with 15 million shares in 2001, increasing to 16 million in 2005. Free cash flow has also been on the upswing with $(3) million in 2003, improving to $3 million in 2005 and $5 million in the TTM. Balance-sheet? The company has $18.9 million in cahs and $19.1 million in other current assets. This is balanced against a $32.4 million in current liabilities yielding a current ratio of 1.17. This is below what I have learned is "healthy" for a current ratio which should be at least 1.5. However, the company has $-0- long-term liabilities per Yahoo. So this doesn't look too bad at all. Valuation? Reviewing Yahoo "Key Statistics" on ININ, we find that this company has a market cap of $232.4 million. 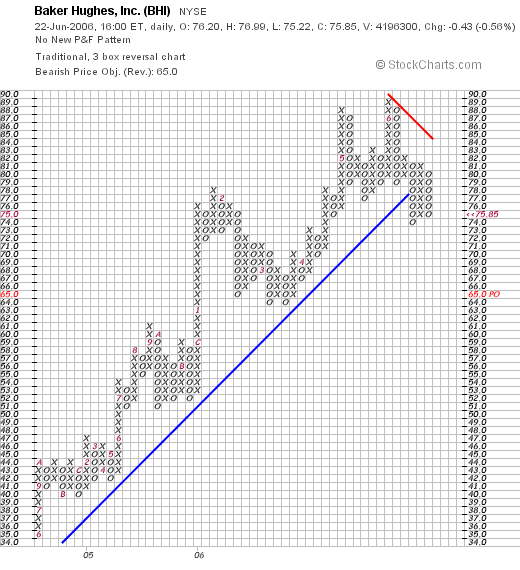 The trailing p/e is rich at 77.32, with a forward p/e of 36.28 (fye 31-Dec-07). The PEG ratio, which is reasonable between 1 and 1.5 imho, is also richly valued at 2.22. Checking the Fidelity.com eresearch website, we can see that ININ has a Price/Sales ratio of 3.3. This is relatively rich in the "Business Software and Services" industrial group. Other stocks in the group are led by BEA Systems (BEAS) with a ratio of 4.2, First Data (FDC) also at 3.3, Automatic Data Processing (ADP at 3, Business Objects (BOBJ) at 2.4, and Fiserv (FISV) at 2. If we review profitability, we find that Interactive (ININ) is actually the most profitable in the group with a ROE of 41.7%. This followed by FISV at 19.7%, FDC at 19%, ADP at 18.9%, BEAS at 13.2% and BOBJ at 5.8%. Finishing up with Yahoo, we find that there are only 16.41 million shares outstanding with 7.90 million that float. In addition, as of 6/12/06, there were only 14,630 shares out short representing 0.2% of the float and 0.2 trading days of volume. No dividend is paid and no stock split is reported on Yahoo. Here we see an interesting chart with a decline from $17.50 starting in May, 2001, to a low of $1.50 in October, 2002. After breaking through resitance at $4.50 in June, 2005, the stock has once again started moving strongly higher to its current level of $14.13. The chart looks encouraging. Summary. What do I think? Well it is an interesting, albeit small company. The latest quarter was quite strong, and the Morningstar.com report shows a gradually improving picture with revenue and earnings growing, free cash turning positive and a reasonably strong balance sheeet. Valuation-wise, the p/e is rich, the PEG is over 2.2 and the Price/sales is near the top of its group. Profitability, however, exceeds the other companies in the same group. And with the company as small as it is, certainly a premium in valuation is warranted imho. Thanks again for stopping by! If you have any comments or questions, please feel free to leave them on the blog or email me at bobsadviceforstocks@lycos.com. Please also be sure and visit my Stock Picks Bob's Advice Podcast Site. Hello Friends! Thanks so much for stopping by and visiting my blog, Stock Picks Bob's Advice. As always, please reemmber that I am an amateur investor, so please consult with your professional investment advisors prior to making any investment decisions based on information on this website. A few moments ago another of my stocks in my actual trading portfolio hit a sale point on the downside. SRA International (SRX), which I had purchased 320 share of on 2/1/05, at a cost basis of $29.82, was sold at $27.26, for a loss of $(2.56) or (8.6)%. This was my only sale of this stock and as per my trading strategy, I unload the entire position if it hits or passes an 8% loss. Also per my strategy, I shall be "sitting on my hands" with the proceeds, waiting for a sale of a partial position at a gain (what I call a sale on "good news"). Thus, my portfolio, which had been up to 24 positions of my maximum 25, is now down to 14 positions (still ahead of my minimum of 6). Fortunately, it appears that this round of selling is done, and the rest of my stocks are moving slightly higher this afternoon for the most part! Thanks again for visiting! If you have any comments or questions, please feel free to leave them on the blog or email me at bobsadviceforstocks@lycos.com. Also, be sure to visit my Stock Picks Bob's Advice Podcast Site. Kyphon (KYPH) "Weekend Trading Portfolio Analysis"
This blog serves a lot of different purposes. For one thing, I am trying to enhance my ability in picking stocks for potential price appreciation. In addition, I am working on my own trading strategy that determines which stocks to buy, when to buy them and when to sell them. I guess that is something we are all trying to do! Before I get to the actual review of Kyphon, let me point out that this stock is an 'old favorite' of mine, having first posted Kyphon on Stock Picks Bob's Advice on October 30, 2003 , and revisited this Stock Pick on May 20, 2005. This is also the second time that I have owned this stock having purchased 300 shares of Kyphon on April 5, 2004, and sold all 300 shares with a loss of $(734.69) after only 8 days, selling the shares on April 13, 2004. My current holdings of 150 shares of Kyphon were purchased May 20, 2005, with a cost basis of $29.21/share. I have already sold 50 shares of my original 200 that were purchased 7/8/05 at a price of $37.98, with a gain of $8.77 or 30%, my first targeted appreciation point. At that date I was selling 1/4 positions of my stock. Subsequently, I have adjusted this to 1/6th positions at targeted gains to avoid diminishing the size of my original investment. KYPH closed at $34.69 on June 23, 2006, for an unrealized gain of $5.48 or 18.8% since my purchase. Since I have already sold one portion of my original holding at a gain, my next targeted sale on the downside would be at break-even or $29.21. On the upside, my next partial sale (1/6th of my remaining shares) is planned at a 60% appreciation point, which would work out to 1.60 x $29.21 = $46.74. Anyhow, that's what I have been doing with Kyphon....let's take a closer look at the stock itself. 1. What does the company do? "...engages in the design, manufacture, and marketing of medical devices to treat and restore spinal anatomy using minimally invasive technology. 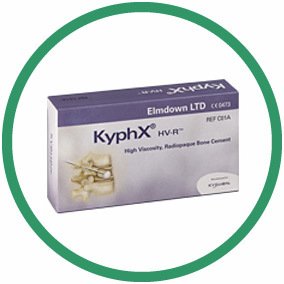 Its products include KyphX Bone Access Systems, which is used to create a working channel into fractured bone; KyphX Xpander, Elevate, Exact, and Express inflatable bone tamps, which are disposable sterile devices that combine the functionality of a metal bone tamp with the engineering principles of medical balloon technologies." 2. How did they do in the latest quarter? On April 27, 2006, Kyphon reported 1st quarter 2006 results. Net sales for the quarter ended March 31, 2006, came in at $91.4 million, a 38% increase over the same quarter in the prior year result of $66.2 million. Earnings per diluted share grew 27% to $.19/share up from $.15/share the prior year. The company related in the report how due to new accounting requirements related to stock-based compensation, these results would have been even better without this additional reporting included. 3. How has Kyphon been doing longer-term? Reviewing the Morningstar.com "5-Yr Restated" financials, we find that revenue has steadily and rapidly grown from $36.1 million in 2001 to $306.1 million in 2005 and $331.3 million in the trailing twelve months (TTM). Earnings, which dipped from $.65/share in 2003 to $.50/share in 2004, increased to $.66/share in 2005 and $.70/share in the TTM. It should be noted that the company has been modestly increasing its shares outstanding from 38 million in 2003 to 44 million in the TTM. However, this less than a 16% increase in shares outstanding has been accompanied by an almost 300% increase in revenue. Free cash flow has grown from $9 million in 2003 to $65 million in the TTM. Insofar as the balance sheet is concerned, Kyphon looks terrific with $217.2 million in cash reported enough to cover both the combined $64.7 million in current liabilities and the modest $8.9 million in long-term liabilities combined almost three times over! If we calculate the current ratio by adding the $217.2 million in cash with the $85.8 million in other current assets, we have $303 million in total current assets which when divided by the $64.7 million in current liabilities yields a current ratio of 4.68. Generally speaking, a current ratio of 1.5 or higher is considered 'healthy' so a ratio of 4.68 is very strong indeed! 4. How about some valuation numbers on this stock? Reviewing Yahoo "Key Statistics" on Kyphon, we find that the stock is a mid-cap stock with a market capitalization of $1.53 billion. The trailing p/e is rich at 49.77, and the forward p/e is a bit better (fye 31-Dec-07) at 27.75. In spite of this rich p/e, the (5 yr expected) PEG is only 1.11, still suggesting that the stock is reasonably priced (imho). 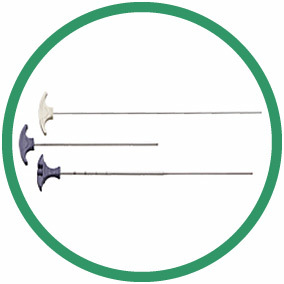 Using the Fidelity.com eresearch website, we find that Kyphon is in the "Medical Instruments/Supplies" industrial group. Looking at the Price/Sales ratio, we can see that KYPH is second richest in valuation by this parameter with a Price/Sales ratio of 4.8. Topping this group is another of my "picks" Cytyc (CYTC) at a ratio of 5.9. Following KYPH is Stryker (SYK) at 3.7, Becton Dickinson (BDX) at 2.8, Baxter International (BAX) at 2.4 along with Boston Scientific (BSX) at 2.4. Looking at profitability, specifically the "Return on Equity" (ROE), we find that Kyphon is lowest in this group with a ROE of 13.2%. Topping this group is Baxter (BAX) at 21.8%, Cytyc (CYTC) at 20.7%, Becton Dickinson (BDX) at 20.3%, Stryker (SYK) at 20.2% and Boston Scientific at 14.1%. Thus by these particular ratios we find the disturbing combination that this particular company is the second 'richest' in valuation by the Price/Sales ratio in this group while being the last in terms of profitability. Clearly, this stock is being valued in terms of future results and not entirely by current performance. Finishing up with Yahoo, we find that there are 44.22 million shares outstanding and 43.29 million that float. Of these shares, 6.08 million are out short representing 13.80% of the float or 10.8 trading days of volume (the short ratio) as of May 10, 2006. Using my own 3 day short ratio rule, this appears significant, and may lead to a short "squeeze" if the company should continue to report strong financial results. The second quarter which ends in a few day should be reported in a few weeks. 5. What does the chart look like? 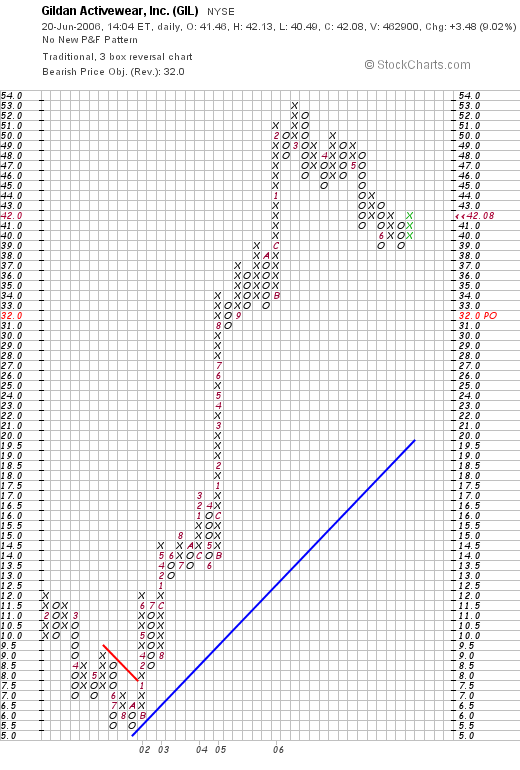 If we review the "Point & Figure" chart on Kyphon from StockCharts.com, we can see that the company dipped from $14.00 in late 2002, to a low of $6.50 in November, 2002. Since then the stock has been moving higher to a high of $46 in November, 2005. 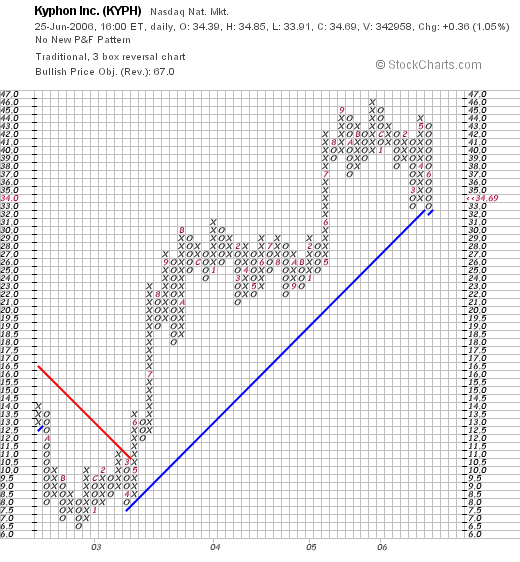 The stock has been consolidating in this range and is now testing its "support line" at the $33.00 range. It clearly has been under pressure the past month while the market has corrected, however, it does not appear to have totally broken-down at this point. 6. Summary: What do I think about this stock? First of all I like this stock enough to own it :). 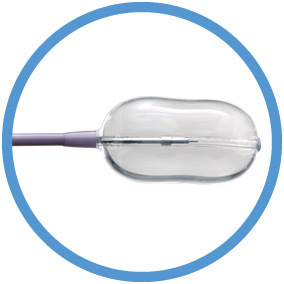 But seriously, looking through the information I have examined, we find that this company is a 'young' medical device manufacturer that is demonstrating its ability to grow sales strongly, is increasingly profitable, is generating increasing free cash flow and has a great balance sheet. Valuation-wise, we find that this company may be 'priced for perfection'. The p/e is rich at 49.77, but the PEG is nice at 1.1 suggesting the expected rapid earnings growth. The Price/Sales ratio is also second in its group indicating the rich valuation. And the ROE is at the bottom of its group, pointing out that profitablility, which is likely improving quickly, is still not robust relative to other stocks in its industrial group. On the plus side, there are lots of people betting against the stock with over 10 days of short interest outstanding. However, with a solid earnings report next month, this could turn against the shorts. In addition, the chart still looks strong although on the short-term, it has been under pressure alongside most of the stocks in the market. Anyhow, that's my review of Kyphon, one of the stocks I still own in my trading portfolio! Thanks so much for stopping by and visiting! If you have any comments or questions, please feel free to leave them on the blog or email me at bobsadviceforstocks@lycos.com. Please also remember to visit my Stock Picks Bob's Advice Podcast Site where you can listen to me talk about many of the same stocks I write about on this blog! Hello Friends! Thanks so much for stopping by and visiting my blog Stock Picks Bob's Advice. As always, please remember that I am an amateur invesor, so please remember to consult with your professional investment advisors prior to making any investment decisions based on information on this website. I apologize for missing a couple of weekend reviews. Long story. But anyway, I am back on track! In order to assess the validity of what I write about here on this website, I have been trying to review past picks going a week at a time. I review all of the picks that week and calculate their performance based on a simple "buy and hold" strategy. In practice, I actually manage my portfolio in a disciplined fashion, selling my poorly performing stocks quickly and completely, and selling my stronger appreciating investments slowly and partially at targeted appreciation points. This difference in strategy will of course affect performance. On March 23, 2005, I posted Forest Laboratories (FRX) on Stock Picks Bob's Advice when the stock was trading at $37.90. Forest closed at $37.56 on June 23, 2006, for a loss of $(.34) or (.9)% since posting. On April 25, 2006, Forest Laboratories announced 4th quarter 2006 results. For the quarter ended March 31, 2006, revenue for the quarter increased 16% to $756 million from $653 million the prior year same period. Diluted earnings per share grew 87% to $.28/share from $.15/share in the prior year same period. On March 25, 2005, I posted Aladdin Knowledge Systems (ALDN) on Stock Picks Bob's Advice when Aladdin was trading at $23.26. ALDN closed at $19.46 on June 23, 2006, for a loss of $(3.80) or (16.3)%. On April 24, 2006, ALDN reported 1st quarter results. Revenue for the quarter rose to $22.9 million from $20.3 million the same period last year exceeding analysts' expectations of $22.6 million. Net income climed to $3.8 million or $.25/share, up from $1.2 million or $.10/share in the prior year same period. Analysts had been expecting earnings of $.27/share. Thus, revenue exceeded expectations, but earnings which grew nicely didn't quite meet expectations. So how did we do with these two stock picks from that week a little over a year ago? In a word, mediocre :(. These stocks had an average loss of (8.6)%. A Reader Writes "HELX....Since then the stock has gone down. Any ideas?" "I bought Cal Dive, 200 shares at 36.00. It went up to around 45. Then I decided to buy some more and when I started to, it had a name change to Helx. I bought 1,000 shares at 39.80. Then there was an announcement that Cal Dive, a wholly owned subsidiary of Helx was coming out with an IPO. How can an established company with issued stock, making good money, change the name and then come out with an IPO? The logic of this has been figured every which way, by me, and I can't figure it out. It seems to me all the gravy is going to go to new stockholders, while I originally bought it for the earnings. Now Cal Dive = Helx is call an energy solution company. Since then the stock has gone down. First of all Marie, thank you so much for writing. I would hate to say that 'your guess is as good as mine' for an answer, but maybe I can shed some insight on your excellent question. Before I do, I want to emphasize one thing about my investment approach. While I am concerned about things management does, the most important driving factor in my investment decision process is the price of the stock itself. If indeed you had reached a 30% gain (which you were close to if not there), I personally would begin selling shares and not averaging up. Then if the stock had dropped to break-even, I would have sold the whole thing kit-and-kaboodle! But that is my approach, and yours might be even better. I do like the idea of making a small investment and then if the stock appreciates a certain amount, making my "full" investment. However, that's not what I do around here :). "The choice of an appropriate new name has perplexed us for many months; however, we believe that the acquisition of Helix RDS last year brought us a perfect answer. A helix is of course a spiral, but, more interestingly, a double helix is the natural shape that defines the structure of DNA, a basic building block of all of us. The two strands of the double helix are anti - parallel, which means that they run in opposite directions. "The clear analogy for us is that we regard it as entirely natural for our strategy to have the two strands of energy service and production. These strands have also proven to be counter cyclical, as service activity lags changes in the commodity prices which drive production returns. "Therefore, our new name will be HELIX ENERGY SOLUTIONS and we pledge to continue to focus on both high quality service provision and value adding oil and gas production, as a partner and operator. "While we take the name of one subsidiary, we will on pass 'Cal Dive' to our Shelf services business unit. We may then sell a minority stake in it via an initial public offering later this year. This press release does not constitute on offer of any securities for sale. The proceeds from such a sale would be used to help finance a planned investment program in service assets that are more core to our strategy, e.g., production facilities or even a second Q4000-type vessel. "We look forward to the support of all our stakeholders as this 'twist' of fate unfolds. In return we will strive daily to be as successful as 'Cal Dive' has always been." The very next day the company announced an outstanding 4th quarter 2005 result with revenue climbing to $264 million from $163 million the prior year. Diluted earnings more than doubled from $.32/share in the fourth quarter of 2004 to $.69/share in the same quarter in 2005. What more could an investor want? On May 2, 2006, the company now named Helix (HELX) announced 1st quarter 2006 results. These were also outstanding with revenue growing from $159.6 million to $291.6 million in 2006. Earnings came in at $.67/share, up sharply for the first quarter 2006, from $.32/share in the same quarter in 2005. In addition the company raised the lower end of earnings guidance for the full year 2006 to $2.70 to $3.30/diluted share. What else could an investor want? "Helix Energy Solutions Announces Filing for Initial Public Offering of a Minority Stake in Its Subsidiary, Cal Dive International, Inc.
HOUSTON, May 31 /PRNewswire-FirstCall/ -- Helix Energy Solutions Group, Inc. (Nasdaq: HELX) announced today that Cal Dive International, Inc. (a wholly-owned subsidiary) filed with the Securities and Exchange Commission a Form S-1 for its planned initial public offering (IPO) of a minority interest in Cal Dive's common stock. The offering will be made only by means of a prospectus. Once available, preliminary prospectuses may be obtained from Cal Dive International, Inc., 400 North Sam Houston Parkway E, Houston, Texas 77060 or by calling (281) 618-0400." " About Cal Dive International, Inc.
Cal Dive International, Inc., a wholly-owned subsidiary of Helix Energy Solutions, is a marine contractor that provides diving, pipelay and pipe burial services to the offshore oil and natural gas industry. Helix Energy Solutions is an energy services company that provides innovative solutions to the oil and gas industry worldwide for marginal field development, alternative development plans, field life extension and abandonment, with service lines including diving services, shelf and deepwater construction, robotics, well operations, well engineering and subsurface consulting services, platform ownership and oil and gas production." So indeed this is all very confusing. And I don't think the "street" much liked it either. Anyhow, I don't think much about all of this accounting stuff. If the stock price indicates I should sell shares, I do so whether on good or bad news. However, sometimes, if you see something which seems peculiar or confusing, you might just want to back out of an investment. This particular maneuver doesn't sound too bad to me. It appears that the company wants to spin-off the CalDive subsidiary to the public and use the funds to enhance the Helix Energy portion of the company. I suppose they view the development of oil and natural gas assets, if I am understanding this properly, of more potential than the CalDive underwater work. Just my guess. Let's take a quick look at the chart and see when the company started showing technical weakness in the price. 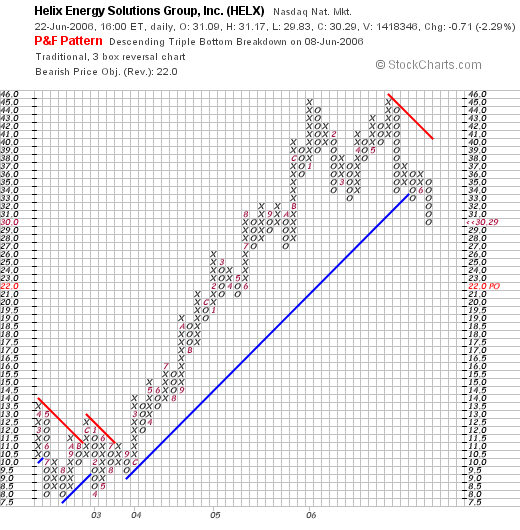 Looking at the Helix Energy Solutions "Point & Figure" chart from StockCharts.com, we can see that the stock price actually started showing weakness way back in January, 2006, and then in May, 2006, even before the IPO announcement, the company stock price was struggling. But is this really due to the stock or is it just the lousy market banging up this stock? I think you see my point. All of the stocks in this industrial group, and indeed in the entire market started breaking down in May. So while we can be annoyed and confused and perplexed about all of the dealings of the Management of this company, there are larger forces afoot called the stock market that were bearing down on this stock like so many others. Getting back to my original point about responding to the price of stocks and not what the meaning of all of the news really is. I just am not good enough to tell if the accounting strategy and spin-offs are good for the investors or not. I do know when I am losing or making money however :). Thanks so much for stopping by, visiting and writing a letter!!! Your input and participation is greatly appreciated. Please be sure to send your comments and questions to bobsadviceforstocks@lycos.com. Let me know your name (first name and location is adequate) and how you use my blog, etc. Also, be sure to stop by and visit my Stock Picks Bob's Advice Podcast Site. One of the peculiarities of my portfolio management system is my approach to selling stocks. I sell stocks, as most traders do, on basically two situations: either on "good news" as my stock market appreciates in price in which case I am selling partial positions--usually 1/6th of my holdings; or on "bad news' which means that the stock has declined from a certain point and given me a sell signal. I have three points at which I plan on selling a stock on "bad news": either at an 8% loss after an initial purchase, at "break-even" if I have sold a partial position of the stock one time (usually at a 30% target), or at a 50% retracement of the highest sale point on "good news". The last sale may be the most complex to explain. But it really isn't that complicated. If I have sold a portion of a stock at 60%, then I sell all of my remaining shares if the stock retraces to a 30% appreciation point. This goes on for all of my partial sales. In the case of Helix Energy Solutions (HELX) (the former CalDive), I had sold the stock four times (! ), with the last sale being at a 120% appreciation level. Thus, my targeted sale of all of my remaining shares was at a 60% appreciation point. The stock passed that point in the last day or two and is actually moving higher today. A few moments ago, I sold my 142 shares of HELX at $29.84. These shares were acquired 11/3/04, at a cost basis of $19.10/share. Thus, I had a gain of $10.74 or 56.2% on this sale. However, after the initial purchase I made four sales at gains, selling 50 shares on 2/25/05, 37 shares on 8/1/05, 28 shares on 11/22/05, and 28 shares on 1/12/06. Thus with four sales, at 30, 60, 90 and 120% gains, my targeted sale point on the downside was at 60% appreciation. Coming back from a few days away from the market, I realized that HELX had passed that sale point, and this morning, remaining under the 60% appreciation point, I went ahead and sold my remaining shares. Fortunately, stocks are trading a little healthier today, and I may soon be able to add a new position instead of continuing to unload my portfolio at targeted sales. But in the meantime, I shall continue to strive to maintain trading discipline and follow the rules that I have established for my portfolio. Thanks so much for stopping by and visiting! If you have any comments or questions, please feel free to email me at bobsadviceforstocks@lycos.com and please be sure to visit my Stock Picks Bob's Advice Podcast Site. Gildan Activewear (GIL) "Revisiting a Stock Pick"
It is great to be back blogging after a few days off. Nothing much has happened to my trading portfolio. The market seems to be bouncing around in here looking for some support. Hopefully, the stock continues to move higher from this level. Looking through the list of top % gainers on the NYSE today, I came across an old favorite of mine, Gildan Activewear (GIL), which as I write is trading at $41.65, up $3.05 or 7.90% on the day. I do not own any shares or have any options in this stock. Let's take a closer look at this stock and I will show you why it still deserves a spot on this blog. "...engages in the manufacture and marketing of basic activewear for sale principally into the wholesale imprinted activewear market in Canada, the United States, Europe, and Asia/Pacific. The company manufactures and sells 100% cotton t-shirts and 50% cotton/50% polyester t-shirts, placket collar sport shirts, and fleece products in various weights, sizes, colors, and styles. It also sells its products as ‘blanks’, which are decorated with designs and logos for sale to end users." 2. Is there any news to explain today's move? "Based on Kentucky Derby's current level of profitability, the acquisition will initially be neither accretive nor dilutive to Gildan's earnings. However, once the integration of Kentucky Derby is complete, Gildan currently expects the acquisition to enhance annual E.P.S. by approximately U.S. $0.30. 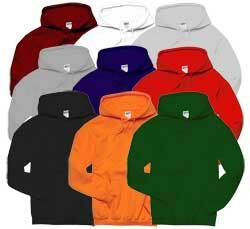 Gildan plans to undertake the integration process during fiscal 2007 and 2008." On top of this acquisition, the company raised guidance for its third fiscal quarter, and indicated it should achieve or exceed analyst consensus of $.67. Previously, the company had guided at $.63/share. They also raised guidance for the full 2006 fiscal year to $2.00/share, up from $1.96 previously estimated. Both the acquisition, which was thought to be accretive for the company's finances and the overall raised guidance was enough to push the stock higher today. 3. How about the latest earnings results? Last month, on May 4, 2006, Gildan reported 2nd quarter 2006 results. For the quarter ended April 2, 2006, Gildan reported net earnings of $31.0 million and diluted eps of $.51/share, with net earnings up 40.3% and eps climbing 37.8% from the $22.1 million and $.37/diluted share reported in the second quarter of fiscal 2005. Sales for the quarter increased 11.2% to $183.8 million, from $165.3 million in the same quarter last year. Thus, with this report, the company did what I call a "trifecta-plus", that is, they reported increased earnings and revenue, beat expectations, and raised guidance! 4. What about longer-term results? For this information, let's review the Morningstar.com "5-Yr Restated" financials. Starting out with revenue, the bar-graphs show a perfect picture of steady revenue growth from $330.4 million in 2001 to $653.9 million in 2005. Earnings have increased steadily from $.01/share in 2001 to $1.01 in 2004 and $1.43/share in 2005. The company has slowly increased the float from 53 million shares in 2001 to 60 million in 2005. This is a 14% increase in shares accompanied by an almost 100% increase in revenue from 2001 and an almost 100% increase in earnings from 2002. In other words, while I would prefer to see shares not increasing, if the company can increase its revenue and earnings many times faster than the increase in shares, I can handle it! And the free cash flow? Unfortunately, I don't see these numbers on Morningstar.com. However, if we look at the balance sheet, we can see that the company has $69.8 million in cash and $258.0 million in other current assets, giving them a total of $327.8 million in total current assets. When compared to the $112.9 million in current liabilities, this results in a current ratio of 2.90. In addition, the company has $64.1 million in long-term liabilities. 5. What about some valuation numbers? Reviewing Yahoo "Key Statistics" on Gildan, we can see that this is a mid-cap stock with a market capitalization of $2.52 billion. The trailing p/e is a moderate 23.08 with a forward p/e of 16.61. Utilizing the 5-yr expected earnings, gives us a PEG of only 0.81. Using the Fidelity.com eresearch website, we can see that within the industrial group of "Textile-Apparel Clothing", Gildan is richly priced with a Price/Sales ratio of 3.4. This is the top of the group and is followed by Bebe Stores (BEBE) with a Price/Sales ratio of BEBE. Next is Guess? (GES) at 1.9, Columbia Sportswear (COLM) at 1.4, Quiksilver (ZQK) at 0.8, and Hot Topic at 0.7. In terms of profitability, Gildan is at the tops of its group with a Return on Equity (ROE) of 25.7%. This is followed by Guess? (GES) at 24.3%, Bebe (BEBE) at 19.9%, Columbia (COLM) at 17.5%, Quiksilver (ZQK) at 10.8%, and Hot Topic (HOTT) at 7.9%. Thus, while valuation is rich by Price/Sales ratios, profitability is also tops in its group. Finishing up the data from Yahoo, we find that there are 60.07 million shares outstanding, with 311,030 shares out short as of May 10, 2006. This represents 1.7 trading days of volume and doesn't seem significant to me. As noted earlier, the company last split June 1, 2005, when they declared a 2:1 split. 6. What does the chart look like? We can see the initial decline in stock price from $12.00 in February, 2001, to a low of $5.50 in September, 2001. Since then, the stock has climbed sharply to a level of $53 in March, 2006. The stock has retreated to the current levels around $39, and appears to be moving higher once again. The graph appears to be consolidating at this level, but the strong upward move does not appear to be reversed. 7. Summary: What do I think? Let's review some of the data that I have been reviewing from this company. First of all, the company announced that earnings should be higher than expected today and that they are acquiring a hosiery manufacturing company to add to their line of merchandise. This acquisition was also estimated to be additive (or accretive) to the financial picture. The last quarter was quite strong (and the company also raised guidance at that time), and the past five years also have been good for GIL. Unfortunately, Morningstar.com doesn't report the free cash flow, but with the solid balance sheet, this doesn't appear to be a problem. The company valuation-wise looks nice from the perspective of a P/E under the growth rate (with a PEG under 1.0). However, the Price/Sales is a bit rich within its industrial group, although the profitability puts the company at the top of similar companies--again suggesting reasonable valuation. Finally the chart looks nice. So in summary, I like this company. I don't know much about the Tee-shirt and sweatshirt business. However, this company appears well run and is doing quite well. Thanks so much for visiting! If you have any comments or questions, you can leave your comments on the blog or email me at bobsadviceforstocks@lycos.com. Please also be sure to visit my Stock Picks Bob's Advice Podcast Site.